No one likes a pessimist. Well, I suppose that other pessimists like them, but pessimists are such downers. I tend to have a pessimistic attitude towards life and living. Pessimists may be right more often than optimists, but the optimists have much more fun. What got me to thinking along these lines was my dog Buster. Buster, and I guess dogs in general only know how to be optimistic about life. I had just left the house this morning and no sooner had I pulled out of the garage than I realized I had forgotten my book. I pulled the car around front and went in the house to get it. Buster figured that since I had left and come back again he deserved a treat for protecting the house. It didn’t matter to him that I had been gone less than a minute. Sometimes dogs are disappointed. Buster will after all this time of not getting people food, still hang around under the table hoping for scraps to fall I suppose. Since Hurricane and Tornado have come along, he does get the odd dropped tidbit. The other day, just after lunch, Tornado came into the back room and told me that Buster was on the kitchen table. He is an optimistic opportunist. In some ways I guess I am also an optimist, I continue to buy lotto tickets long after experience and good sense have indicated that I should stop. My mantra is “You can’t win without a ticket!” Sadly, it seems that I can’t win no matter how many tickets I buy. My mom was the same way and I vowed that I would win a lottery for her. I think at the time I felt that if Lady Luck thought I wanted to win for someone else then she would let me win. It seems that Lady Luck is not as gullible as I had hoped. Sorry mom! I sometimes use my pessimism to change the reality I am caught up in. If I want the weather to be dry and sunny, I just imagine that the weather guy will get it wrong and it will be rain and cold. I see the weather report on the late news and plan for the worst. The next morning, the weather is never as bad as I had predicted, so in a way I changed the weather by being pessimistic. You have to be careful though, because you don’t want to always be negative because like attracts like and no one needs two negatives in their lives. I have decided to try and be positive in my thoughts and actions from now on and see where that takes me. I am pretty sure that we are looking at travel, unexpected windfalls and of course good health. 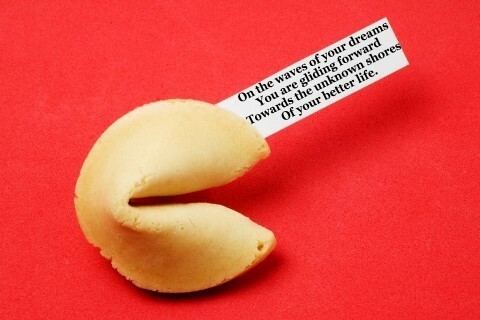 Maybe the secret to life is to live like you are a fortune cookie.